Well we are in the medal rounds for sure. Thank goodness, because I was extremely nervous after the way we started. Getting those early losses was not what I was planning on from this team. However, after a ridiculous game against China and a 4-2 win over Chinese Taipei, we are going to play for a medal. We have a game against Japan tonight which doesn’t mean much except whether or not we are going to be the third or fourth seed for the semi-finals. That will determine if we play Cuba or Korea first. Either one is tough so I don’t think it matters that much, then again we need to win so it means a great deal. China’s game was absolutely absurd. For those of you that watched it, and for those of you that really understand the game, we did nothing wrong. Well, except at the very end when Blane Neal ran over to tag the runner, which is actually okay, but then rolled the ball into their dugout. That, we should not have done. But both collisions at the plate were okay in the game of baseball. I know some of you are thinking that the second one was probably cheap but if you watch the whole play, the ball was cut off from the outfield by the first baseman and then the catcher is standing right next to the plate if not on top of it. But if you see his body language, he is trying to fake out our runner by making it look like there is no play and then when the first baseman throws home the catcher is going to try and tag our runner. When Nate hits him, the catcher is trying to catch the ball if he hadn’t already. So that play is clean. Not to mention the fact that right after LaPorta ran into the catcher, Donald was hit. Then we were hit again, and again. The game got really out of hand when their guy hit LaPorta in the head, basically knocking him out. I believe, along with many other guys on the team, that it was called from the dugout to hit him. I would like to think that China’s coaches are smart enough to not call for the ball at his head, but who knows. What I think happened is that the China team is young in the game and doesn’t know how to play it right yet. That is why I think it got out of hand. Especially the way the guy who hit the homer acted. You would have thought he just hit a walk off the way he was acting. Running with your hand in the air and then stomping on home plate is unacceptable and Blane Neal showed good composure not to absolutely light up the next hitter. In the States, that is what would have happened. We restrained ourselves a lot and people might not really know that. We did win that game and the game against Taipei so we are now in the medal rounds. After tonights game we will see who we play first on our long and grueling trip to try and get gold. Character. Thats what was displayed today in our game against Canada. We had played Canada so many times before today that we knew everybody they had, except one and he was their starting pitcher today. He dealt against us at the beginning and kept all of our hitters off balance and we were unable to do anything. Brett Anderson was our starter and did a great job. He gave up four runs somewhat early but really shut them down when we really really needed it. I think we put up a couple of runs and then Brett would come in and get a shutout inning. He kept us in the game when we needed it too. Then, in the sixth, I came in with two outs and runners at first and third. Adam Stern was up to bat, also a former Cornhusker. I was able to get him to strike out looking. Our team then managed to put up a couple runs in the 7th and another one in the bottom of the eighth. So then I went out for the ninth to try and close the deal. I think that was the most nervous I have been in a long time. In the last inning I got the first guy to fly out to right. Then the next guy gets a hit. I then struck out the next guy. So there is a runner on first and two outs and Stubby Clapp came up to bat. History has it that Stubby has had some heroic moments before when playing against USA. So I knew it was going to be tough. But there is something that happened during this at bat that I have never done before. I got on the rubber in the wind up instead of the stretch. Everyone started yelling step off, step off. So I looked at the runner at first thinking he was taking off when it occurred to me that I was in the wind up. So, while trying not to panic, I was yelling at our catcher to call time-out. I actually balked a couple of times I think before I stepped off the mound correctly. The umpires did not call it at all though, thank goodness. Anyways, I get a full count of Stubby and I shake to a slider, and he ropes it down the right field line. I couldn’t believe he I just hung that slider. Clear down the right field corner and just foul. He then fouls off the next pitch and the next pitch after that is a fastball on the outside part of the plate. He flew out to left and we beat Canada. It was a big time must-win situation and we pulled through. We still have a chance to play for a medal if we can keep it going. Character. It’s what we showed out there today. It was a great team win. I really think we can keep this going. It is really hard to share my thoughts right now due to the way we are playing. We are already 1-2 and do not have any gimmes the rest of the way. We played a decent game against Korea but it felt like we were trying to feel things out instead of just playing like I know we can. In that game, I feel like we learned a lot about our team and we showed some strengths and weaknesses. On the pitching side, we really didn’t start off well but late in the game we had some clutch performances by our relievers. We came in and kept the game close to give ourselves a chance. I came in, I don’t remember what inning, and I faced three lefties. I struck the first guy out, the next guy grounded out and then I struck out the last guy. Then I came in the top of the next inning and got the first lefty to ground out before they replaced me. Offensively, we seemed to struggle early. Korea had a guy that threw a lot of breaking stuff and he kept us off-guard. We finally got to their starter and relievers enough late to take the lead in the top of the ninth. However, in the bottom half, we kind of threw the game away but that stuff happens. We showed that we can make pitches when we needed to, get clutch hits when we need them, we don’t give up, and we have a really good line-up. Also, in the top of the 9th Mike Hessman hit probably the farthest home run I have ever seen. We lost it in the darkness. It was huge. THe next game we played the Netherlands and we dominated from the get go. Strasburg absolutely dealt against them. He had a no-hitter through seven or six (I can’t remember). We won 7-0 and had the ninth inning rained out. We started at 10:30 that morning and didn’t get out of there until almost 6pm. It was a long day and even though we won, a lot of us were unhappy and hungry. That night I went to the silk factory to get fitted for some suits I had made. They are pretty sharp and they did a great job at making them so I bought another one. Other than that, we didn’t have much time to do anything else since we were at the field all day and had another early game. Today we played Cuba. We knew they were good, but going in I felt like we would handle them well. We didn’t. Our starter, Cahill, looked real shaky in the first but really shut them down the rest of the way. Our offense seemed to be slow getting to their starter but we ended up tying it at 2-2. Then, Jeremy Cummings came in and did a great job at shutting them down. He did give up a homer in the 7th though and Cuba went up by one. However, since this game is like a roller-coaster ride, we hit a home run in the bottom of that inning to tie it. In the bottom of the tenth I think I saw one of the most clutch pitching performances of my life. Jepsen came out, in his second inning of work, and gives up a lead-off triple that tipped off our center fielder’s glove. But, then struck out the next two and gets a ground out and they ended up not scoring. It was awesome. I knew from there we were going to win. Instead, we play into the eleventh where we had to do a ridiculous tie breaker thing where each team can choose what part of the line-up they want to start with. Then, you put a runner at first and second. We lost by one. I know in order to be a good team you have to be able to win one-run ball games and we just aren’t doing it yet. But, we aren’t out of it yet and we are going to keep fighting. If we can win all of our next games we are in the semi’s and will play for a medal. If we don’t, then we will need a miracle. So, tonight I am going to just take it easy because we have Canada next and they are heavy with lefties in their line-up. I will more than likely be called upon out of the pen. Then again, I hope we don’t need me because we are up that far. It has been a couple days since the Opening Ceremonies here and there isn’t that much to report. We had another game against China but we just weren’t that into it. I can definitely tell we are just ready to start playing. All this practicing and what not is getting old. However, the President was at our game and that was really cool. I think he only stayed for an inning or two but he took pictures with us and talked to us a little bit. I felt like he just wanted to have a normal conversation about sports. He asked me where I was from and when I told him I was from Nebraska he said “You know I am a Longhorn right?” But then of course he brought up Alex Gordon and Joba Chamberlain. I just cant get away from those two. Even in the USA Baseball programs – our bio stuff in there mentions Gordon and Joba, tough draw I guess. I did get a picture with the President and it’s a good one too. He is looking one way and I am looking the other. It’s perfect. I have been able to venture off of the village recently. We went to the Silk Market, which is a six story building that sells knock-off stuff and you basically negotiate with them and try and get it as cheap as you can. While I was there I bought two suits and each came with a dress shirt. However, the suits and shirts are custom made for me. So that is pretty cool. I also bought a couple of watches and a belt. But they have everything from golf clubs to electronics, watches to jeans, and even luggage. I will definitely have to take my dad there because in his world everything is negotiable, and he will tell you that too. Speaking of negotiating, I was hanging out with Lou, one of our catchers, while we were there and I tell you what, he is a dealing machine. It was so much fun to watch him work with the people selling him the stuff. They would get so mad at him but he would just keep laughing and smiling. He got everything he wanted at his price though. I am excited today because it is the last day before the first game. We have just a light workout at about 5 and then we are good to go. Also, we actually saw sunshine today and it wasn’t humid either. It gave me the feeling of a college football Saturday. Its about that time of year. Opening ceremonies were tonight. As many of you will see it was incredible. I have never been so lost in a presentation before. Everything that happened was magnificent and amazing. We actually started at about 5:00PM here. We all dressed at the village and then the entire USA team traveled in buses to the venue, I can’t remember what it was. Anyways, while every team was there we all took pictures with other athletes and got to know some of them. It was really cool because it seemed like everyone was ok with taking pictures because they were fellow athletes. I got quite a lot of pictures and actually wasted too much of my battery. By the time I got to the Opening Ceremonies, my camera died. At first I was really disappointed about it but then realized that I was able to get really captivated into the moment by just watching instead of always trying to catch a picture of it. Probably was for the better for me. We got to meet President Bush and former President Bush last night as well. 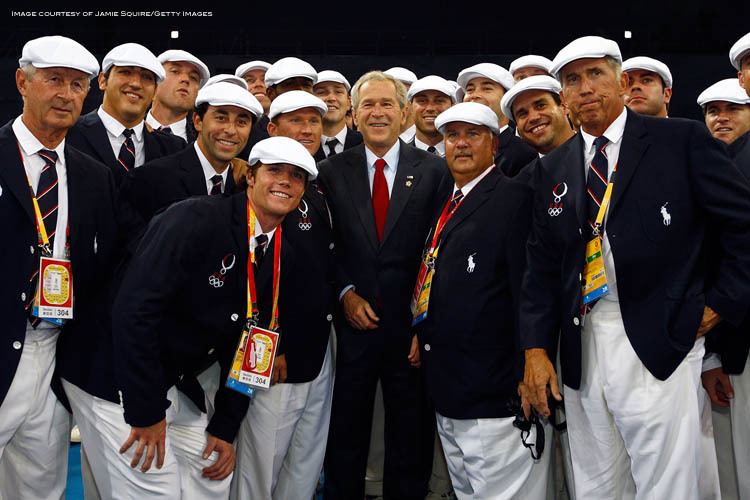 The current President took pictures with every U.S. team and wished us all luck. It was something that I won’t forget. He was a very down to earth guy and very supportive of us. He might have to be now that I think about it but he seemed genuine. After meeting the President, we were put in the gymnasium so to speak. It’s the place where the gymnastic events will be held. Every country was in there waiting for the Opening Ceremonies to start and waiting for their country to be called to walk into the arena. Out of 204 countries, we were number 140. I heard that the order was determined by some Chinese alphabet they used. Didn’t make sense to me how it worked at all. What I am about to describe to you is going to seem probably very jumpy and sporadic but I cant explain all the feelings and sights that I saw. We entered from underneath this huge tunnel and right before we went out we all started chanting “U.S.A.”…It gave me chills and fired me up all at the same time. Then as we come to the opening to go out on the track, we were met by thousands and thousands of people, bright lights, flags, camera flashes. I felt like I was coming out of the tunnel for game seven of the NBA Finals or something, but on a much bigger scale. Then as we made our round in the stadium, we obviously waved to everyone but that is when I realized how much you really pull for your own country, because as we were walking we would see American flags every once in a while and you could tell that every athlete was doing there best to single them out and wave specifically to them. It was just breathtaking. Then to fast forward through the heat, humidity, and sweated through clothes, we get to the lighting of the torch. That was the most unbelievable thing I had ever seen. To see this guy get hoisted up – I don’t know how many feet – and then basically swing through the air all the way around the stadium to stop and light the torch was just unbelievable. And when we finally witnessed the torch light up and heard the thunderous roar of the flame and the crowd we were so excited and relieved. Excited to get started and to play, and relieved that it was finally over. We had to stand in the heat for about four or five hours and sweat. So, when the torch finally lit, it was a mad scramble to get to the buses to get home. It was actually disappointing to feel like that because Jackie Chan was singing at the end. It was pretty cool to see him as well. But the sights, sounds, feelings, and experiences are ones that I will never forget. 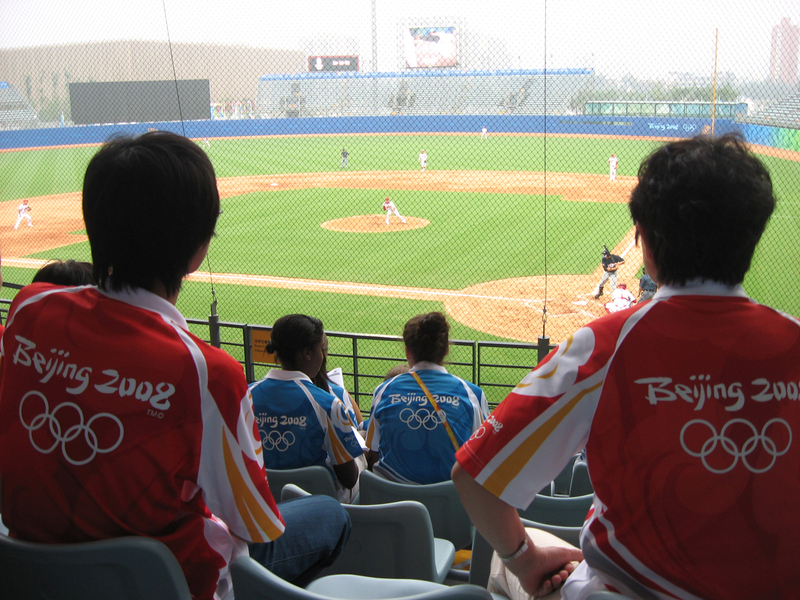 I will cherish them forever and will always remember the opening ceremonies of Beijing 2008. August 7 – Got to the Olympic Village finally. We had a 14 hour flight from Washington DC to Beijing. That was after we had a night game the night before against Canada. We beat them in 7 innings and then I started the 8th inning and struck the first guy out and then broke the next guy’s bat as he grounded out to short. Casey Weathers got the final out. The 8th inning didn’t count but we were just getting some work in. Then that next morning at 4:30 and bused 5 hours to D.C. It wasn’t that bad, really. We watched a couple of movies and dozed in and out for the the whole trip. Once aboard the plane I planned on sleeping but couldn’t get comfortable. Instead I watched episodes of “The Office,” and read a lot. I was sitting next to Brandon Knight and it was good to talk to him and get to know him. We talked a lot about grips and pitching but we also found out we knew some of the same guys as well. He had played with a couple former ‘Huskers and was asking me about them. The guys he was asking about were ones that had left before I got to Nebraska. It’s just good to finally start to know some of our teammates on a different level. After 14 hours we landed in Beijing and started our process of getting checked in. Of course we went through customs and what not but it was pretty easy due to the lines that were for Olympic athletes. Once we got our baggage we were escorted to our bus and headed out to the Village. Everything and everyone has been very accommodating and helpful. The Village is a very nice place and there are tons of athletes. I am excited to try and meet some of them. Maybe give my German speaking skills a little work. Then again probably not. Tonight we have a practice game against China and then that’s all I know of. I am looking forward to Opening Ceremonies tomorrow night. We can see all of the buildings from the Village and they are spectacular. China has done a great job of preparing for the games.